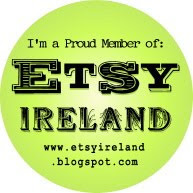 With the FETAC Textiles in full swing and another Irish class, I seem to be busy all the time. We did sketching for our notebooks last class and worked on some collage concepts for design. This last class we dyed fabrics and practiced knotting, tying, and stitching fabric before it went into the dye to experiment with design. I liked folding and then stitching. The pieces all turned out pretty well, but the dye in the one silk piece I did bled all over the other four lovely pieces and so all looked kinda poorly when I took them out when I got home. That's life. But I was happy enough with what we learned. I did have time during the week to make these two lovely alien creatures with my son. He needed two new heavyweight bookends to support the new books he got for Christmas. If you sneeze in his bedroom, they all wobble and most often go cascading off the shelf. So, I bought a load of New Clay from Cork Art Supplies and we got to work. We knew we wanted aliens and I let Fionn just go to town. Mine is the mother and child alien, which I ended up doing because I needed her to hold something because I am bad at hands! But I like her with the child. Fionn's has a pet beside it. We did them Tuesday night and they are still drying because they are so big and thick. Hopefully we can paint them during the week. I got some lovely Jacquard Lumiere paints at Christmas and so we will paint a base coat and touch them up with the Lumiere's. Today I spend most of the day trying to organize the house and laundry. I made coconut macaroons, chilli jam, risotto verdi, and a lovely orange jello/jelly. So, tomorrow I must get felting for the entire afternoon. I am determined to update my blog more often, so I hope to get felting pics up tomorrow night! Why did I ever think January was a slow month? I have changed jobs back to work at Aiseanna na hOige creche, started Irish and textile FETAC courses, and have a two friends having babies so must get going on blankets. I had one pram blanket started in red and pink and she had a boy! So back to ground zero on that one. Hopefully it will do for the second baby due in March. I did get a Magic Book done for a friend's son. He is four year old and I figure still ripe for all the magic of possibilities. I got him his OWN scissors and glue stick, washable markers, and watercolour paints. He can draw and write to his heart's content and cut out pictures from magazines etc. There are lots of O's all over the front because that is his special letter. I am hoping this also helps while away the time on the bad winter weather days. I think he will get it when I show it to him. Gotta encourage that creativity in kids because I notice that school doesn't seem to do it much. I got Fionn and myself a big, somewhat heavy (12.5 kilos) bag of clay and we are going to make bookends to start. If someone sneezes loudly in his bedroom, all the books fall over and start cascading off the shelf, so I am hoping that his is fun and practical. We are either doing a pair of robots or monsters and I have some Jacquard Lumiere paints to pretty the whole thing up when its finished. The textile course is underway! Hooray that we finally got enough people to get it going again. We did straight embroidery for the first class, trying out new stitches. Not sure what we are doing the second class, but we need to bring in a kitchen utensil, which is intriguing..... I think Una ni She will let us do a lot of experimental stuff, too, which is good to muck about and find out what works and what doesn't. We are also working quite a lot at developing a sketchbook for design purposes. I ordered a big one and some pastels for doing colour in the small one that I have. If they aren't frozen! It's a cold beginning to the New Year, but this much I know is true: onward and upward! 2009 was a bit of a bear and so I am *hoping* for a bit more improvement in 2010! My FETAC Textiles course is looking good to go in January and even if the silly job goes, I will manage somehow. I am just hoping to stockpile craft supplies as that will be the extra expense that I will have a hard time fitting in. 1. Quit smoking (again, but for good this time). 2. Keep developing craft skills and product samples. 3. Get the upstairs painted. Lord knows it needs it!! 4. Get a bit more fit. Quitting smoking will help with that. 5. Find a bit more joy in my life. Holidays end tomorrow and I head back to the job for at least two more weeks and see where we end up. Besides tidying my bombsite of a house and trying to stay warm, there has to be more to life??? ?